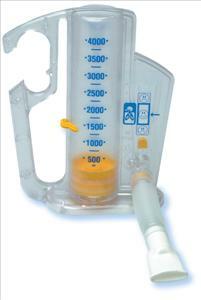 Medline's incentive spirometer makes it easy for patients and staff alike. One-way valve ensures patients inhale rather than exhale into the unit. Highly visible pistons and universal graphics (indicating correct inspiratory flow rate). Other features include an oxygen connector for supplemental oxygen, convenient handle, flexible popple tubing and bedrail holder. 4,000ml Capacity and One-Way Valve.